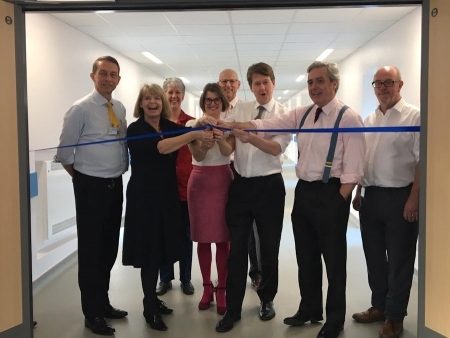 West Worcestershire MP Harriett Baldwin joined county MPs to formally open the new bridge created at Worcestershire Royal Hospital which is already adding extra capacity for local patients. The new footbridge which connects the main hospital to the nearby Aconbury building will mean that there are extra beds to help cope with extra winter pressures. Harriett viewed the new bridge with her fellow MPs Robin Walker MP, Rachel Maclean MP and Mark Garnier MP and chatted to staff and patients at the newly refurbished Avon ward. The new bridge means that patients will no longer need to use an ambulance to transfer from one part of the hospital to another, taking the pressure off both staff and the ambulance service – reducing their waiting time at the busy hospital. The MPs also met with the Acute Trust’s new chief executive, Matthew Hopkins, and the Trust’s chairman, Sir David Nicholson, who has also been formally confirmed in his four year posting. The new bridge is part of a series of improvements costing over £29 million which will add capacity to the Worcestershire Royal Hospital and improve services delivered at Redditch’s and Kidderminster’s hospitals. Harriett commented: “It was great to see the bridge completed – there has been intensive lobbying by the county’s MPs to secure the funding – and it is heartening to talk to staff and patients about what a difference this is already making. “We are right in the middle of the winter peak and we all hope that this is the first step towards helping the hospital coping better with the inevitable extra demand. “The new management team has an important task ahead completing this improvement work and supporting our highly-valued doctors and nurses to keep doing an amazing job. “I continue to repeat the message to the local health bosses that the feedback I get regularly from constituents is that the staff do an amazing job day in, day out and they should be congratulated for that.